In an alley in New York City, a man trapped in a high-tech suit of armor known only as Specimen Q breaks into a street repair truck to purloin a jackhammer. The Teenage Mutant Ninja Turtles take exception to this and leap down from the rooftops. Specimen Q, whose dialogue is barely intelligible through the armor, encourages the Turtles to rough him up as much as they possibly can. The Turtles oblige and after a cartoonish battle within a conveniently action-obscuring dust cloud, concede that they cannot so much as put a dent in their foe. Disappointed, Specimen Q tries the jackhammer out on himself, only to break the equipment on his impregnable outfit. Frustrated, he storms off. 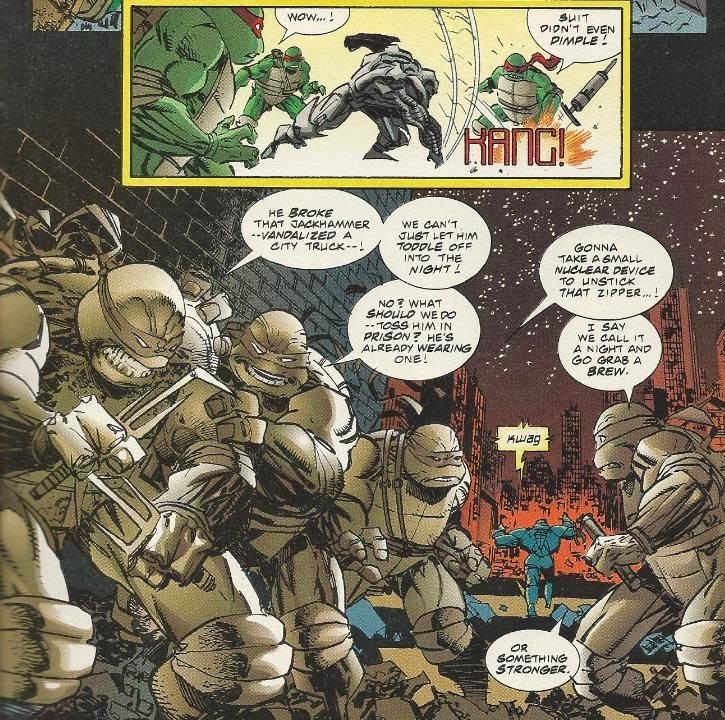 Raph bitterly demands they go after their enemy, but Don and Leo talk him out of it, as Specimen Q appears to be less of a villain and more of a victim. Mike simply suggests they head home and grab a brew. *As the none of the Turtles are disfigured, this story must take place before TMNT (Vol. 3) #1. *The Turtles will encounter Destroyer Duck again (or appear in the same crowd as him) in The Savage Dragon #41. *My summary only covers the Turtles’ involvement in the story. The actual plot of the special focuses on Destroyer Duck escaping from his Specimen Q armor and teaming up with Officer Dragon to rescue “Leonard the Duck” from an angry foe and defeat Dr. Brainard, the man who trapped him in the armor in the first place. *Destroyer Duck was last seen (as Specimen Q) in Image’s Codename: Stryke Force #14. The sequence in which Destroyer Duck rescues “Leonard the Duck” from Homicidal Elf is actually a sly quasi-official crossover with the events of a Marvel comic also written by Gerber, Spider-Man Team-Up #5. The Savage Dragon/Destroyer Duck #1 is, quite frankly, a fascinating look at the behind the scenes politics of the comic book industry and a story I’d recommend to anyone interested in such a subject. The issue was basically done as a means for Steve Gerber to take back his creation, Howard the Duck, from Marvel Comics by any means necessary. 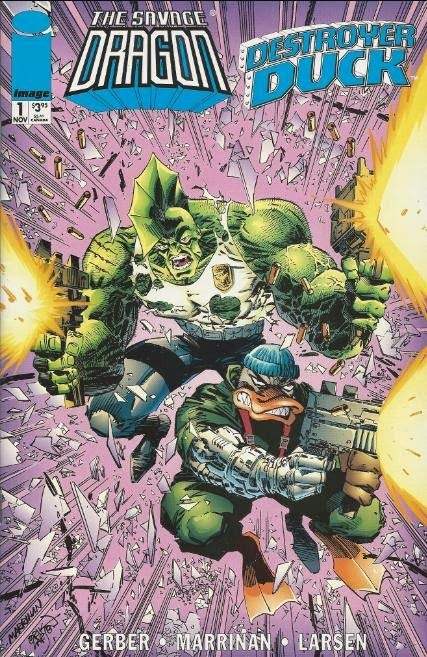 By cleverly writing the same event into two comics at once (Spider-Man Team-Up #5 and Savage Dragon/Destroyer Duck #1), albeit from two separate perspectives, Gerber successfully managed to sneak his creation back from Marvel’s clutches, albeit in a rather abstract and out-of-the-box manner. Spider-Man Team-Up #5 features Howard entering a warehouse fight and leaving with the titular webhead. This comic shows us what really happened, as the “Howard” that left with Spidey was no more than a soulless clone created by the Elf, while the real Howard escaped with Dragon and Destroyer Duck, joining the witness protection program and changing his name to “Leonard” (after a quick dye-job and a pair of glasses for disguise). It’s a very sly way of sticking it to the corporation that stole his creation and a clever maneuver I applaud Gerber for making. Sure, Marvel remains free to use their “Howard” as much as they want, but all it’ll ever be is a “soulless clone” without Gerber. A not-so-subtle metaphor, sure, but an apt one at any rate. The issue also featured two editorials, one by Erik Larsen and one by Steve Gerber, both featuring some very unkind words about Marvel and corporate comics in general. Larsen’s turns into a massive advertisement for Image Comics toward the end, as he expounds their integrity when it comes to creator-owned properties. He briefly mentions that they “aren’t perfect”, but quickly brushes that under the rug to continue his advertisement. Todd McFarlane basically trying to steal characters away from Neil Gaiman and tying him up in legal battles for over a decade is treated by Larsen as little more than a “meh”, which I find laughable, as it is a tremendous blemish on Image’s integrity and in direct opposition to their business plan and promise of creator ownership. Not something to just pass up with a “hey, nobody’s perfect”, Larsen. Gerber’s extended editorial, which is more of a history lesson, is far more interesting, as he describes the trials and tribulations that Marvel put him through in regards to his fight to reclaim Howard, as well as how that battle led to the birth of Destroyer Duck back in the 70s. This puts much of the antics from this issue into perspective if you weren’t already aware of the politics, but doesn’t diminish the entertainment value by “explaining the joke”, either. I think it’s something a lot of comic readers should learn about, especially if they hope to one day “break into” comics, as it illustrates the precarious situation working for corporate comics can be. 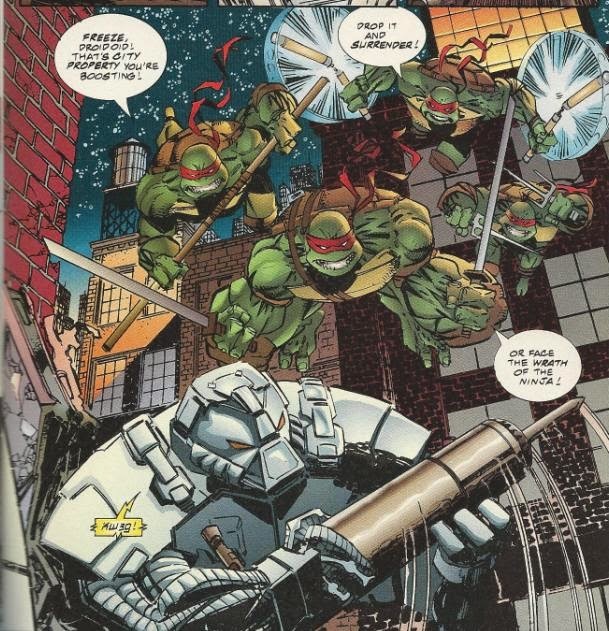 Oh, and the Turtles were in this comic, too! Yeah, I almost forgot all about em. Their participation is completely random and they could easily be swapped out for any guest star from Image’s stable, as they provide nothing more than a brief fight scene to showcase the durability of the Specimen Q armor Destroyer Duck is locked in. There really isn’t a whole lot to say about them beyond that, other than the fact that Chris Marrinan seems to draw them with Erik Larsen’s models. Of course, Gerber's point was kinda undermined later when he went back to Marvel to write Howard again (the MAX miniseries), once again proving principles are fine but in the end Almighty Dollar will always win anyway. Not to mention, well, for a comicbook setting, implying a clone is 'soulless' by default is kinda, well... troubling? Howard's already an alien animal, the TMNT themselves are mutates, Savage Dragon is another alien, at least one of the Turtles' best friends is a robot and another one is a magical drawing come to life. Are they any less 'soulless' than a clone is? They're all sapient beings.